That bridge has been burned.....to ashes. Maynor won't leave A&M for NCCU. Too much of a step down in facilities, less fertile recruiting ground, plus the Eagles are strapped for cash to keep up in an arms race to do what they really need to do right away with their infrastructure. It's not exactly the most attractive situation for a established coach to step into right now. With their smaller fan base, it's probably a more attractive job for a good coach from the D-2 level or a young FBS assistant coach (aka Mack) who is looking for a starting point on his resume as a head coach. Maynor has become extremely popular down there and besides he would leave there for only one job and we know what job that would be. I hear you A1. I don’t personally know Maynor but I got to think there’s a thought to come back home. Remember he started at Winston, game to T and coached at FSU. The only stop left on Tobacco Road is Central. He knows the state recruiting wise. Only thing is if he goes to Central he will never coach at T. I’m sure Ingrid will reach out to him. Great point. NCCU is very limited in the infrastructure department due to space & capital, although they have made improvements in dorms & classroom facilities. I took a walk down memory lane last Saturday at the Alphonso Elder Student Union & Barber Shop where I used to get my haircut as a kid. I realize now that my dad would take me over there to have me in a college environment as a kid, and I appreciate that even more now. But walking through there compared to our new Student Center... I felt bad because there really isn't any comparison now between A&T & NCCU at any level other than Men's Hoops. 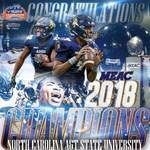 And with the crushing 45-0 over NCCU Football this year following the definitive victory and 12-0 season last year, the gap in football just widened that much more. We need a major fundraising push to get started on the Athletics Facility. But if we get our minds right as an alumni base and get that done... there won't be anything stopping us at FCS level.